The stringer beads on the left were TIG welded by my instructor. The ones on the right were the made by me after about an hour of practice. I started taking a 10-night, 30-hour TIG welding course this week at a welding supply company. I enrolled partly because I enjoy learning new skills and partly because TIG welding is especially useful in a machine shop. You can use it to weld almost any kind of metal and it can make very small, precise and neat looking welds with very little heat distortion. It’s also a very clean welding process that you could do in your living room without getting yelled at too much because it doesn’t produce any spatter or sparks and it creates little or no fumes. Machinists will frequently use TIG to add a new layer of metal to parts that are worn and then they’ll re-machine them. Mistakes, such as a hole that was drilled in the wrong place, can be repaired in the same way and you probably won’t be able tell they ever existed. 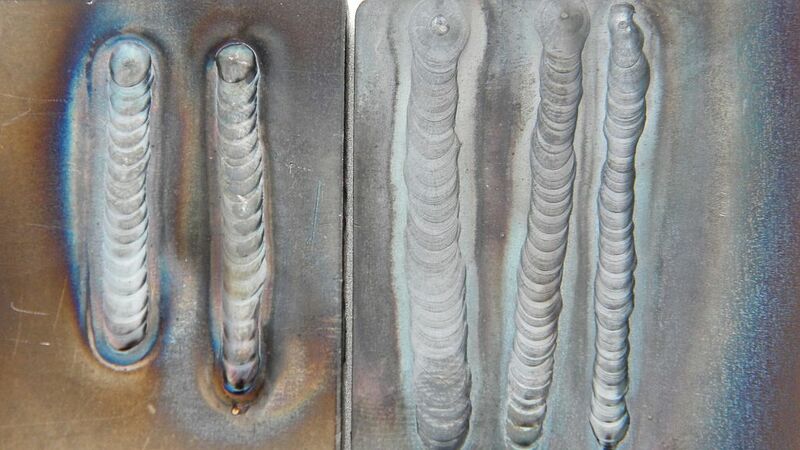 TIG uses electricity to create heat with an electrical arc, which makes it similar to MIG and “stick” welding. But in those two processes the electrode (a wire or rod) gets melted and deposited in the weld. But a TIG electrode doesn’t get “consumed.” It just creates heat and a filler rod is used to add material to the weld puddle if it’s needed. So it’s very much like oxygen-acetylene gas welding but with some huge advantages. You can almost instantly turn the heat (arc) on or off. You can very easily and precisely control the amount of heat using a foot pedal. Sometimes a thumb wheel on the welding torch is used instead. It’s much easier to see and control the weld puddle. You can weld almost any kind of metal. It’s safer. Oxygen and acetylene can be very dangerous. TIG welding is almost always done with argon gas which can’t burn or explode. You also only have to deal with one tank of compressed gas instead of two. TIG welding requires more skill than MIG or stick welding. TIG welding is a slow process. TIG is to MIG what walking is to running. TIG welding equipment costs more. If you’re going to buy a TIG welder make certain it can produce AC (alternating current) because you’ll need it if you want to weld aluminum. Many of the inexpensive/cheap imported TIG welders you see for sale on eBay and the Internet are DC (direct current) only machines. So beware. Being able to weld aluminum is one of the best reasons for buying a TIG welder. You can weld aluminum with a MIG welder but you’ll need to invest in a spool gun and a tank of argon gas. And you still won’t be to make welds that are as precise and as neat as those made by a TIG welder. By the way, most TIG welders can be used to do stick welding. You just replace the torch with a “stinger” to hold a welding rod and go to it. That’s my real quick overview of TIG welding. If you want learn more this Wikipedia article is a good place to start. You can also leave a comment if you would like to hear more details from me. I did get some work done on my “winter” workshop. Some of my wall space was taken up by large plastic storage bins that I’d filled and stacked to the ceiling with things that we don’t use very often. I got rid of some by ruthlessly throwing out (or donating) things we’ll probably never use again. The room also has a really nice big computer desk that’s kind of the modern equivalent of a roll-top desk because all the storage compartments and cubby holes it has. I was going to keep it but I’ve decided not to so I can have a longer workbench and more room for tools. So I’m going to have to throw out or find other places for the things that are in it. I think it’s going to be a tedious chore and some of the storage bins I just emptied will get filled back up. But it has to be done. I like the way you contrasted the TIG and MIG methods; walking to running, expense, argon vs oxygen. I also like just how much stuff you have on here. Some of us have started a subreddit called /r/makeit/ where I posted this article to share with others. Is that alright with you? Come join us if you’d like! Thanks for comment. I couldn’t find your subreddit but you’re welcome to mention my article, but I’d appreciate it if you didn’t republish in whole.